On my recent trip to the States I visited the beloved Trader Joe’s again, as with all my trips down South. 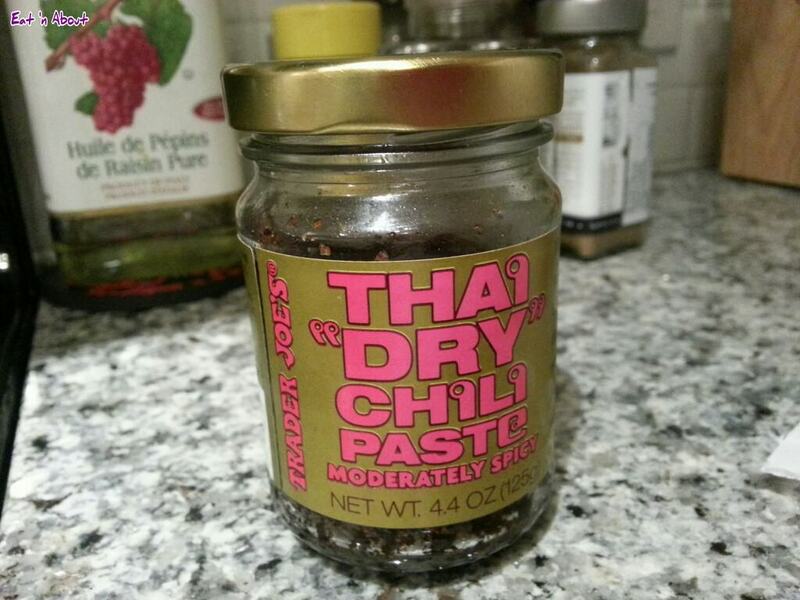 This time one of the products that caught my eye was the Trader Joe’s Thai “Dry” Chili Paste. As Hitman is a huge fan of Thai food, I thought I could make good use of this seasoning paste at home. Plus, it was only $0.99! 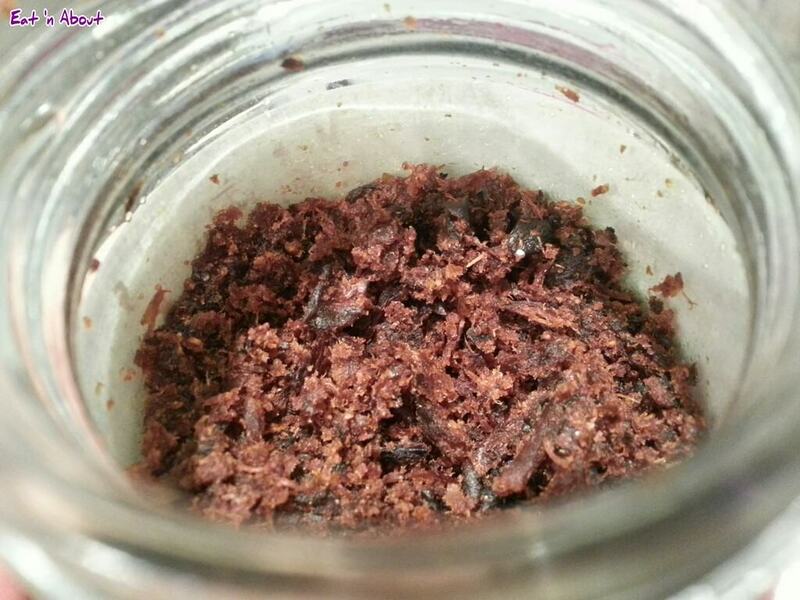 This is a vegan paste made of fried mushrooms and various spices and seasonings such as tamarind, coconut sugar, lemon grass, Kaffir lime leaves, and of course the namesake dried chili. I had a taste of it by itself, just a tiny amount. It’s savory and a bit sweet, but very fragrant of mushrooms. I wouldn’t say that this spice mixture is as “moderately spicy” as the label says, I would say there’s just a kick, unless you eat it by the spoonfuls. When water boils, add your rice and chili paste. Cover pot and turn heat down to a simmer. Cook for 1 hour. Do not lift lid. Then take off of heat and let stand for 5 minutes. Heat 1 tsp oil in fry pan on medium low heat. When heated, add veggies and Ponzu. Stir fry until almost cooked through. Add chili paste and stir fry some more till cooked. Spray grill pan with oil spray. Heat at medium heat. When pan is hot, place filets on pan. Squirt each slice with 1 squirt lemon juice and 1 tsp ponzu sauce. Flip fish over after 3 minutes. Spread half tsp Trader Joe’s Thai “Dry” Chili Paste onto each slice. Cook through. That’s it! 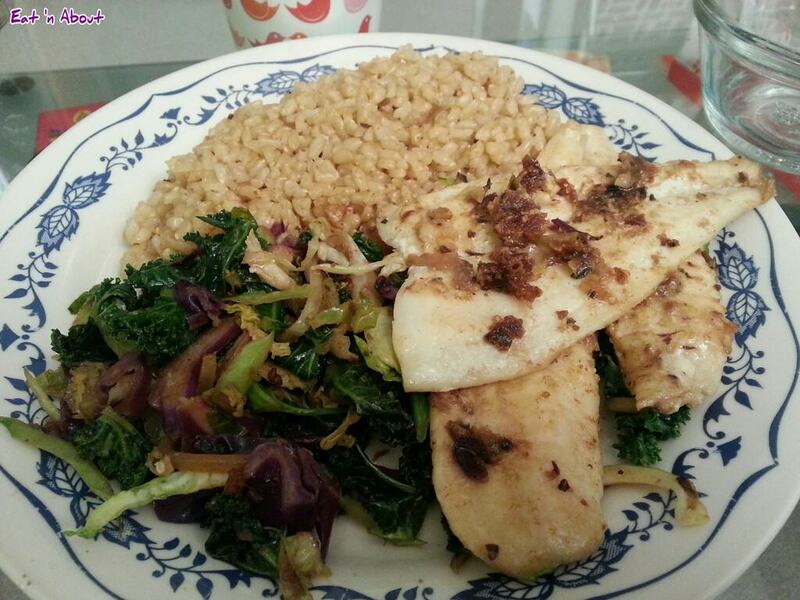 Aside from waiting for the rice to cook, the rest only takes around 15-20 minutes to cook! Overall I really like this product. I’ve only had it for 3 days and already used half a jar (it’s not a big jar), and have already asked Aunt Aggy to get me more!! Hi John, I’m not sure if you can order online. If you live in the US you can buy it at Trader Joe’s, or if you live in Vancouver you can buy it at Pirate Joe’s for $5.99. Happy hunting! It’s moderately spicy if you rub it in your eyes. Don’t ask how I know. Haha I won’t ask! But I’ve got my suspicions! Try it as a vinaigrette, with white balsamic and good olive oil. Divine!!!! Oh man that sounds awesome! I’ll have to add white balsamic to my shopping list! Too bad tho, TJs seem to not carry the paste anymore…hopefully they’ll bring it back! I love this stuff! I mix it into bbq sauce for the best bbq chicken you have ever eaten! I was so disappointed that TJ’s discontinued it! Ya me too! It was such a good product!! That is AWESOME to know!!!! Thanks Eugenie!!!! !